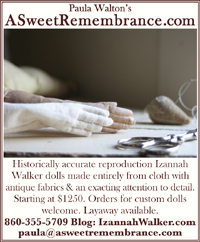 ***Are you interested in attending an Izannah Walker Doll Making Retreat in 2012??? If so please follow this link to my “planning” post and leave a comment to let me know the time of year/dates that work best for you. I haven’t tried to schedule many in person classes in the past couple of years because I know that traveling to a doll making class would be quite a splurge in this economy. However, since I’m doing a number of special events to celebrate my 25th anniversary, I thought that I would see if anyone is interested in coming here, to New Milford, CT, for a long weekend of doll making in September. On Friday, September 9th, I will be teaching an intensive one-day class focusing on the fine details of making reproduction mid 19th century doll clothing suitable for Izannah Walker dolls. We’ll start with my Izannah Walker Reproduction Doll Clothes Pattern for an 18- 1/2 Inch Doll and move on from there to explore some of the intricate and exquisite techniques that make 19th century dress making so beautiful. 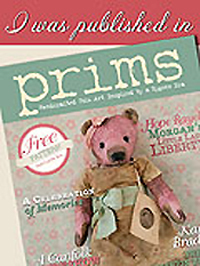 Attendees will need to purchase one of my doll clothing patterns and do some prep work prior to 9/9, so that we can make the most of our class time. Tuition is $115 for the day, plus $29 for the pattern (the pattern comes with the doll making class instructions, so if you are taking both classes, you do not need to buy the pattern for the Friday session) . 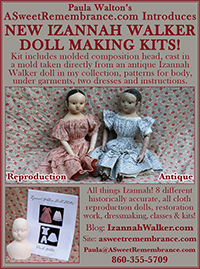 A three-day condensed version of my Izannah Walker Reproduction Doll Class starts on Saturday morning, September 10th. Just like in the clothing class, students will need to order my doll class and do some homework ahead of time. Once you get to class we will be making two types of molds, forming pressed cloth heads, and constructing the doll’s body. 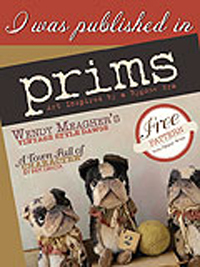 This is a wonderful class for anyone interested in antique cloth dolls and for those who would like to learn to incorporate pressed cloth heads into their own doll designs. Tuition is $285 for 15 hours of class room time, plus $250 for the doll class. You may take just one class or sign up for both. Both classes are intended for fairly experienced doll makers. To get the most out of them you need to already know how to sculpt, paint and sew. I need to have a minimum of 3 students registered (per class) by August 15th in order to hold the retreat. If you already have one of my Izannah doll clothes patterns, or are currently a class member in my Class by Mail group, then obviously you would just need to pay the classroom tuition when you register for the retreat. Classes will be held at my 18th century farm (sorry, no farm animals except cats). 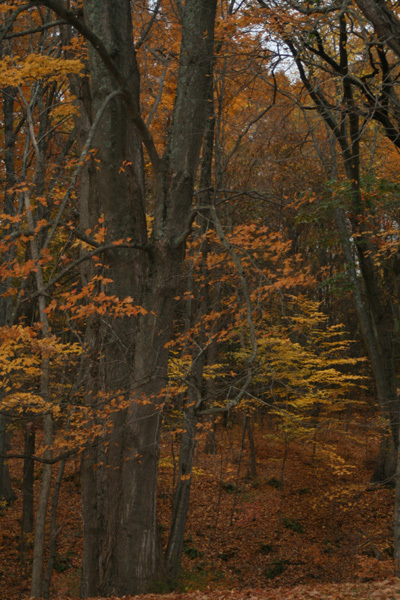 We will be working out of my studio building and a tent*, so that you can enjoy a bit of autumn splendor,if the weather cooperates. 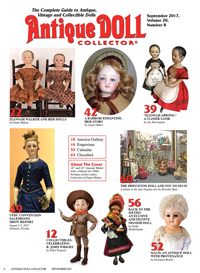 Students will get a tour of my antique doll collection which features cloth dolls including Izannah Walker originals, and early papier-mache milliner’s models (plus more), as well as my c.1790 house. Classes run from 10:00 a.m. – 4:00 p.m. each day, with the exception of Sunday, September 11th. On Sunday class will start at 1:00 p.m., so you will have a chance to go to church, sleep in, have a leisurely brunch, or go shopping at The Elephant’s Trunk Flea Market, one of the best flea markets in New England. On Friday, Saturday and Monday I will whip up something simple for lunch, using fresh produce from my gardens, or you may choose to bring a lunch with you. Tea and coffee will be available all day, because I work best with constant infusions of caffeine :). You will need to bring supplies along with you, as they are not included in the classes. A supply list will be sent out well in advance of September. The exception to this is that I will provide all the plaster you need. If you are flying in and weight is a consideration, you may make arrangements to have silicone mold putty sent here directly. I have numerous sewing machines that you can use, you are also welcome to bring your own portable machine. If you are purchasing the pattern or the doll class by mail and are sure you will still want them, even if the retreat has to be canceled, I will send them to you as soon as you register. Otherwise, I will mail them to you just as soon as I have three confirmed students. There are several hotels and inns located in New Milford. The Homestead Inn is the closest to me, and is within walking distance of the town green. Restaurants are plentiful on the green and in the historic downtown area, although it helps if you like Italian food 🙂 . If you don’t mind a short drive, Kent, CT, just north of New Milford on Route 7, has some nice places to stay. 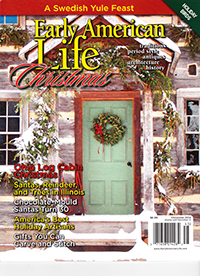 Last year Yankee magazine named Kent as one of it’s Top 25 Foliage Towns. The Brimfield Antique and Collectibles fall shows are September 6 – 11th, so you could easily attend the shows, which are about 2 – 1/2 hours north of here, before heading to New Milford for the retreat. If you love antiques, another great show in this area is the Harwinton Antiques and Design Weekend on September 3 & 4 (formerly held in Farmington, CT). The Stormville Antique and Flea Market is also being held the same weekend, 9/3-4. If you are in the mood for more rustic pursuits, a Farmer’s Market is held on the New Milford green every Saturday from 9:00 – 12:00. I can also recommend the Averill Farm in Washington, CT for pick your own apples, or Maple Bank Farm in Roxbury, CT. for apples and other great produce. There are some delicious, fun places to stop for lunch along the way to either Averill’s or Maple Bank Farm, just ask and I’ll provide details. A picnic at Kent Falls, is another delightful way to spend a fall afternoon. Two scenic covered bridges are just a short drive away and are well worth a visit. If you go to the bridge in West Cornwall be sure to stop in for a meal at The Wandering Moose Cafe. Do you like life in the fast lane? Visit Lime Rock Race Track for their 29th Historic Festival and watch a century of cars in 10 categories compete in sprint races September 2-5. Or visit the big city, New York City (2 hours) and Boston (2 – 3/4 hours) are both within easy driving distance. Need more? I can make enough suggestions to keep you busy sight seeing for at least another week! Ask me. Simply call me at 860-355-5709 or email me, paula@asweetremembrance.com, to sign-up or to ask questions. Payment is due when you register. You may send me a check, money order, or Paypal payment (special instructions apply to Paypal , so that I can refund the entire amount to you in the event of cancellation, without having to deduct Paypal fees). This sounds just wonderful! I will need to discuss this with my husband and see what we can work out. I should have no problem with getting the time off to attend the workshop. I need more time to budget this, so I can not commit yet. But I wanted you to know of my sincere interest. I’d love to have you come! I know it’s expensive and this is not exactly a good time for people to spend a lot of money, so I’ve tried to pack a lot into a few days, so that it will be somewhat more affordable. If I can get enough people interested to make it happen, I think it will be a fantastic weekend. Once I know for sure that I have enough people signed-up, I’m going to see if I can add an extra “surprise” treat for us all. Hello, I just found your site and would have loved to signup for your class in Sept. it sounds wonderful! Will you be offer any other classes, perhaps in the spring? I will definitly sign up to purchase the online tutorial plans for these amazing American dolls. It’s so nice to hear from you. Thanks much for checking back in about the retreat. I have had a few people inquire about coming, but everyone seems to have different dates in mind, and it’s not a large group to begin with 🙂 September is fairly good for me. I’ll take a look at the calendar and see if I can squeeze one in. Then we’ll just have to see if enough people want to come to justify holding the retreat. So once I set a date, spread the word!!! Sounds good to me. Actually ,I can be pretty flexible. The month of August is not good but any other time is fine.Thanks Paula! Hi Paula, In the reproduction Izannah Walker class would we be sculpting a head ourselves or will we use your molds? In the picture of the molds aren’t those your molds of your own antique Izannah’s ? Also in the mail class are we sculpting our own head? I would like to purchase the class by mail but want a pressed molded head from a real Izannah. I know other doll artists that do this in their workshops. They don’t expect the students to sculpt the head thereselves and have it look like a real Izannah Walker even if it is a reproduction. Mary Goddard. It’s so nice to hear from you! 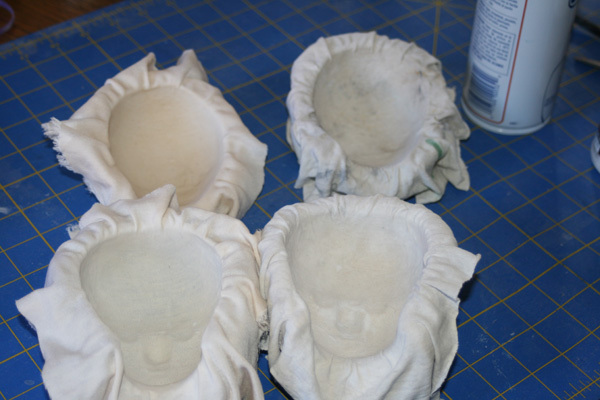 Yes this photo is of my molds from my real Izannahs, that I use for making the dolls I sell. I just happened to use one I took while I was in the midst of making some dolls. I can certainly show you a photo of a mold made using a head that I sculpted – just let me know if you’d like to see it and I’ll post one for you. If you take Part 1 of the 2012 Retreat you would need to sculpt your own head, same goes for my class by mail. If you want to come take Part 2 of the retreat, then you have the option of finishing the doll you started in Part 1 OR using a head I have molded from my real antique Izannahs and body parts I have sewn. In Gail Wilson’s in person class I know she provides molded heads made from a 2 part metal mold that she had made – although I am fairly positive that the mold was not made from a real Izannah Walker doll, but rather from a head she made. She is a very talented doll maker and her work is beautiful! 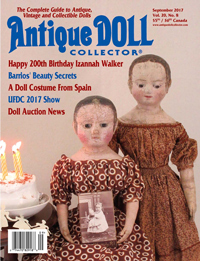 Kathy Patterson uses molds, that she has had made from the antique Izannah Walker dolls that she owns, to make the dolls that she sells. Up to now Kathy has not been teaching any doll making classes. She uses a great papier-mache like composition material to cast her heads, rather than making them out of cloth. Her dolls are gorgeous and her painting is fantastic! 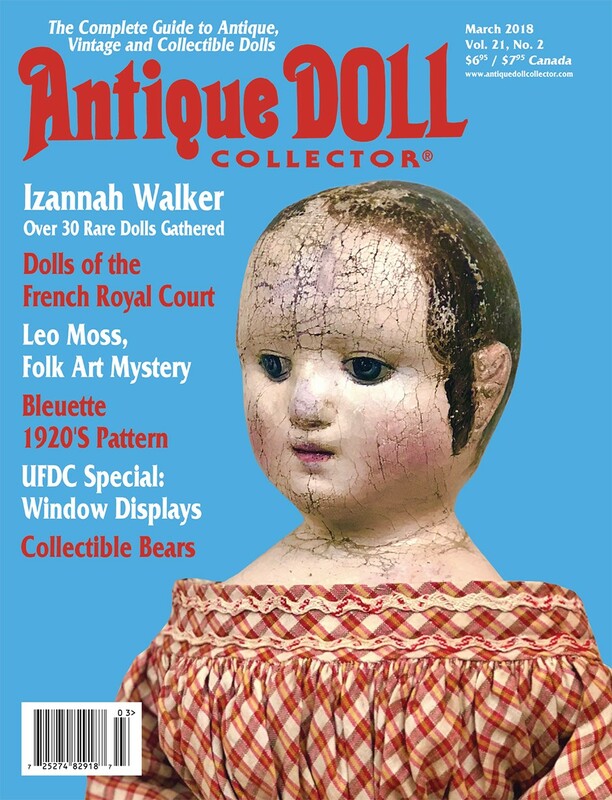 I don’t know of any other doll makers besides Kathy and myself that are currently using molds made from antique Izannah Walker dolls. Dixie Redmond’s online class and pdf book teach you to do a sculpt directly onto a cloth doll and then cover it in stockinette. Students who have taken Dixie’s class liked it a lot. Several of them have gone on to take my class after hers and they have all told me how much they enjoyed Dixie’s. The purpose of my class is to teach you how to sculpt an Izannah head using a series of detailed photographs and very exact measurements, then to make a mold from your sculpt. It also teaches you how to make the body and clothing. It is a master level class for experienced doll makers, as you do need to already be able to sculpt, paint and sew prior to taking the class. I normally do not sell molded heads for people to finish at home, but I am offering them at the 2012 Retreat for people who wish to use them in Part 2 to make a doll.